Listed in the Domesday Book as Berdane, Berden is a peaceful village in the North West corner of Essex, on the border with Hertfordshire and only 5 miles from the border with Cambridgeshire. It is one of the higher parts of the county rising to almost 120m and is part of the chalk uplands that stretch across to Royston. 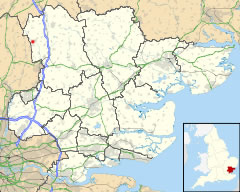 It is in the district of Uttlesford and according to the 2011 census had a population of 465 people. There are two possible derivations of the name, either “swine pasture valley” or “corn valley” both have been used in the village sign below. We have a lively community with many village organisations and events, details of which can be found here on the website. The village also has some fabulous walks with many great footpaths to explore. We hope you will find this website informative and useful.